I had to go back into my archives to share this story. 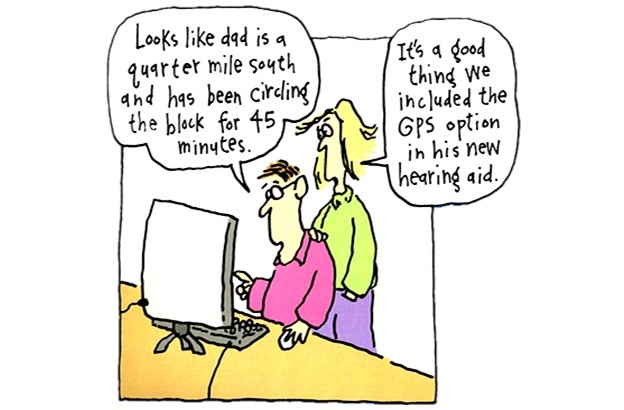 When we opened our business in Venice 8 years ago, we received yearly calendars from our manufacturer and one of the cartoons showed adult children using the computer to track their dadâ€™s hearing aids using a GPS setting. We thought it was funny but never shared the cartoon, since we thought people might actually think there was a GPS setting in hearing aids. The newest model from ReSound, the Linx 2, offers both GPS and connectivity through iPhone or Android. These features allow you to use your smart phone as both a tracking device and a remote. The GPS feature was novel but I didnâ€™t think it would be that beneficial. I understood the premise that a phone linked to hearing aids would be able to locate those specifically linked hearing aids. I just couldnâ€™t think how this might be a benefit to my clients. Then the moment arrived when I learned how beneficial the GPS feature could be. One of our clients purchased the Linx model by ReSound. He called me from the golf course and I assumed he was gloating about being on the course while I was in the office. Apparently, while he was out golfing with his buddies he lost one of the hearing aids. He knew pretty quickly when he lost one since he couldnâ€™t hear his friend as well. Unfortunately, he wasnâ€™t sure where he was on the hole when it was lost. He called me to find how to turn on the GPS feature. Fortunately, he had already paired his hearing aids to his iPhone so turning on the GPS feature was very easy. I walked him through the few steps necessary to turn on the GPS locator. The GPS feature shows a general location. As you get closer the screen changes and shows sensor bars. You get the bars when you are within 25 feet which work like the game hot or cold that enable you to locate the hearing aids. Within 15 minutes of calling me, he had possession of his hearing aid. I didnâ€™t tease him too much that he had lost his aid in the rough on the first hole. If you have a smart phone and are interested in trying out the new technology, call us for an appointment. If you want to see how the apps work with the new hearing aids, I can show you that in my office as well. It still amazes me that a joke from 8 years ago is now our reality.